Cube-ish style. 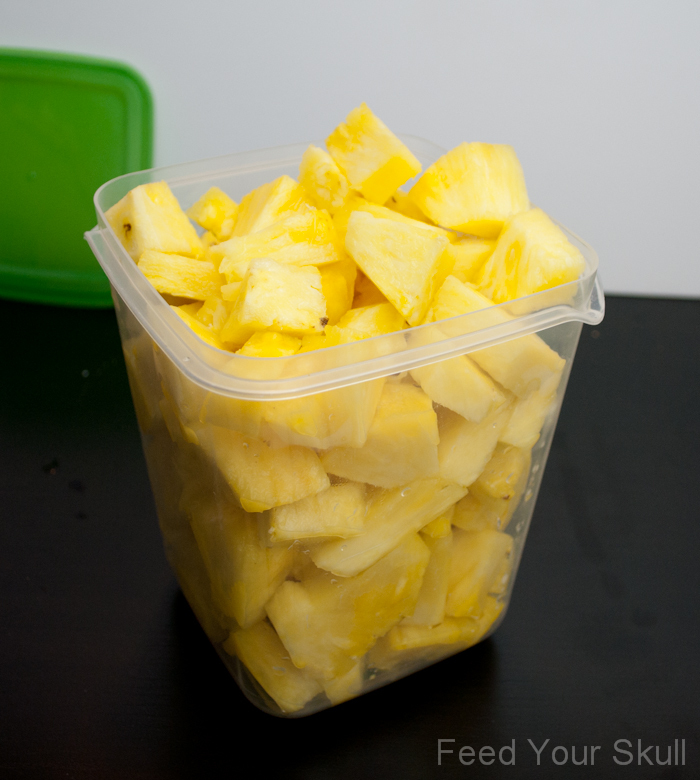 Pineapple is delicious and fresh and juicy. I used to be allergic to it and now I’m not. Like hive patches on my ankles, thighs, and even my chest allergic. I don’t recommend doing this but I always tested it out every so often to see if I was still allergic. Much to my joy, one day, there weren’t any welts to be found. I have no idea why or how but I bow to the pineapple gods in gratitude. Start by picking out your pineapple. How do I do that? An easy trick, while at the store, is to pull out one of the leaves from the center. If it takes some tugging it’s not quite ripe yet. If the leaf easily plucks out, grab that beast and put it in your basket! It’s yours! 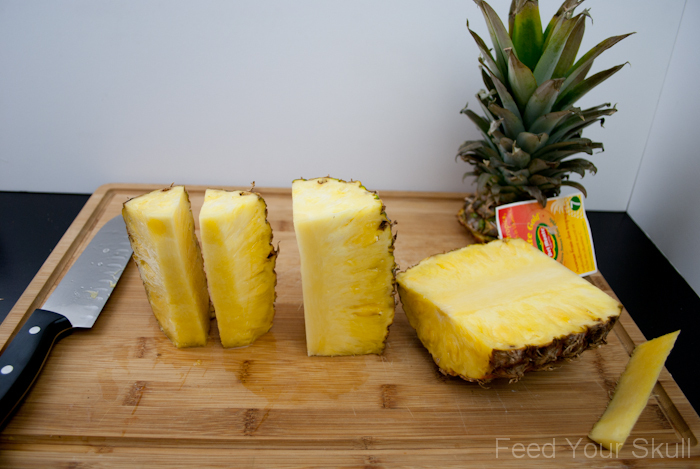 Start by removing the top and bottom of the pineapple. 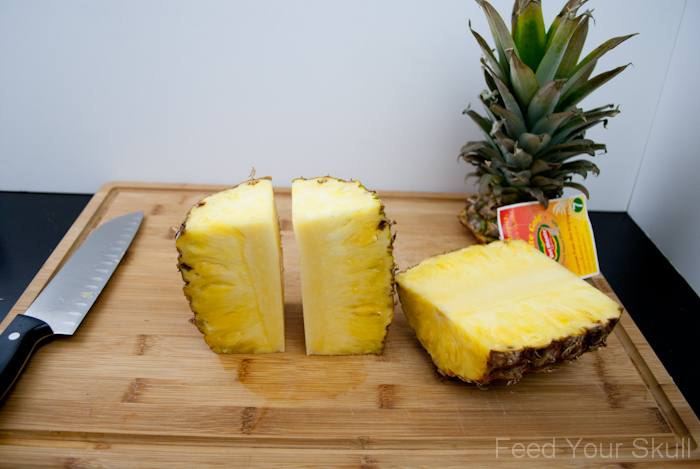 Arrange the body of your pineapple like so on the cutting board and cut in half. From both photos you can see the cylindrical core that runs through the center of the pineapple. We’re going to remove that, but don’t throw it out – especially if you love making smoothies! The core is rich with bromelain, a protease enzyme, that is known for reducing swelling. Great for post surgery remedies or during a sinus cold/infection. 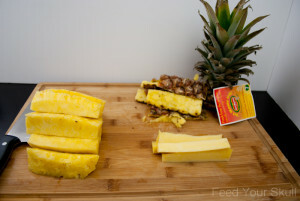 Bromelain can also be acquired through supplements. 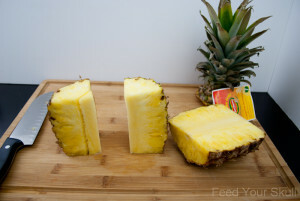 Cut in half again and then make a cut straight down at the point of the center – make sure your cut includes just enough of the core and not too much of the pineapple. It will be triangular shaped. Set core aside. 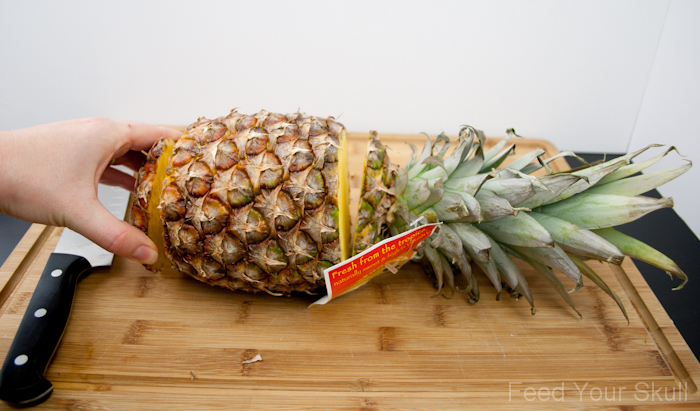 Cut in half again and then remove the skin of the pineapple by cutting about 1/4″ into the flesh. Repeat the process of removing the core and skin with the remainder of the pineapple. 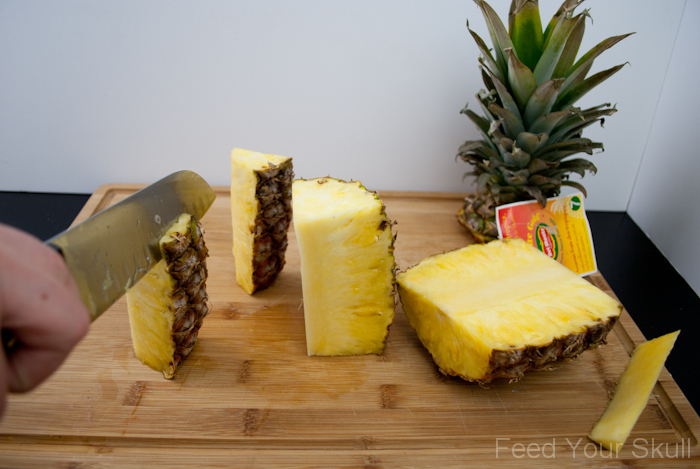 Now cut your cubes. You can either do this one slice at a time or if you feel confident hold the entire group and cut cubes out of the stack. 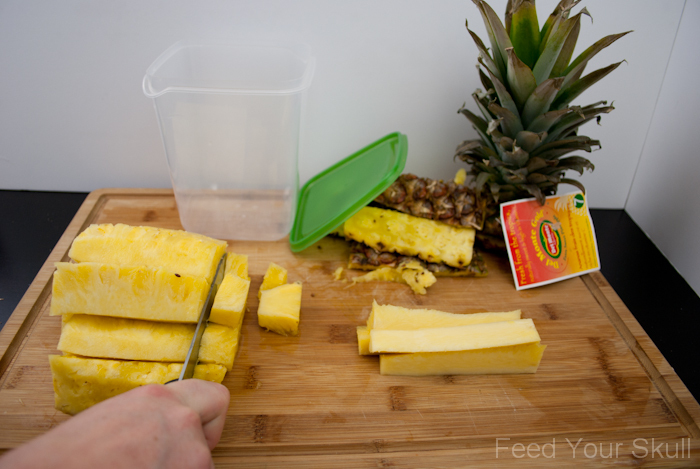 Place fruit in a container to be stored in the fridge or place pieces individually on a tray and plop them into the freezer, once frozen empty into a freezer bag for future smoothies or fruit salads. Remember I told you to save the core and that it was so good for you? If you have a high speed blender, leave them as is and store them in the refrigerator or freezer. If you have a regular blender, just chop the core and store the same way. This will allow your blender to handle the pieces better. 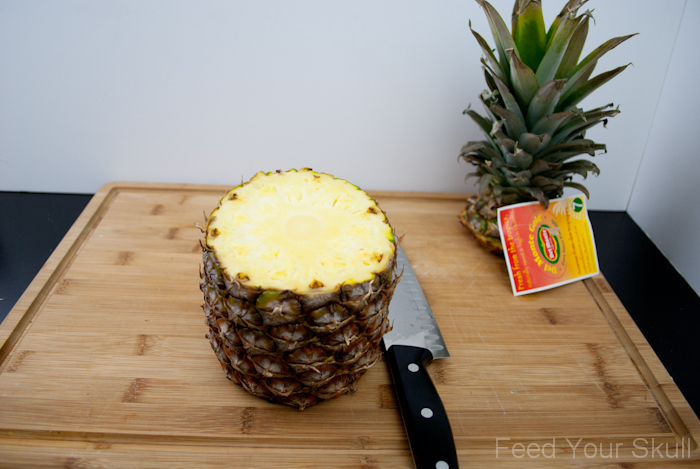 Discard the skin (or use it to start a batch of pineapple vinegar), top, and bottom of the pineapple by composting, garbage disposal-ing or throwing in the garbage. Viola! You are done and can now enjoy that yummy fruit! I had no idea. I am highly enlightened now. I’ve always been fearful of cutting a pineapple. Thank you for this! Center leaves coming out easily is not an indicator of ripeness. 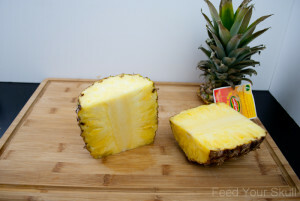 It wouldn’t make sense in nature anyway, since pineapples grow from the center of the top, once the pineapple is ripe. 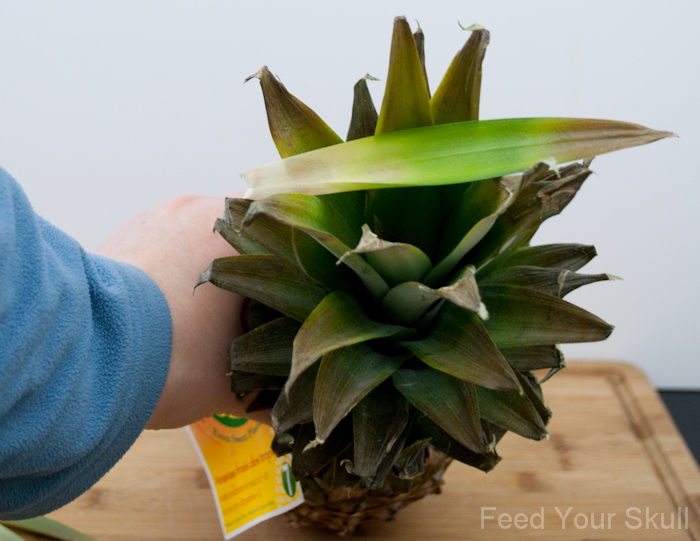 It might be a sign of the pineapple being overripe/old, like the one in your pictures. The center leaves has proved to be a good indicator for me over time though shouldn’t be the only indicator. Also look for a nice golden color. I rationalize it by the way fruit softens/ripens over time. Just like a banana is easier to peel when it is ripe versus unripe.